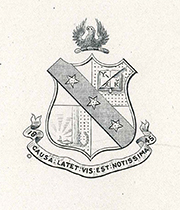 Seven members of the Comedy Club at the University of Pennsylvania submitted a petition for a charter from Alpha Sigma Phi in 1914. The charter members were initiated at New Haven on May 14, 1914, and the chapter was installed on May 16, 1914. In 1920 the chapter house was located at 3617 Locust Street. The chapter was located at 3903 Spruce Street from the early 1920’s to 1969. From 1969 to 1972, the chapter was located at 116 S. 40th Street, and from 1972 to 1978 at 3824 Spruce Street. The chapter closed in 1978, having initiated 832 members. The Omicron chapter was revived in the spring of 2013 and officially re-chartered in the spring of 2015.